The curve of the Victoria Embankment is one of the few places which offers a panoramic view of London as a whole, taking in both the Palace of Westminster and St. Paul’s Cathedral. It links the financial power of the City with the political power of Westminster and is straddled by the historic richness and cultural vitality of the West End and South Bank. Yet it is insufficiently celebrated and its potential as a great place for Londoners remains unrealised. 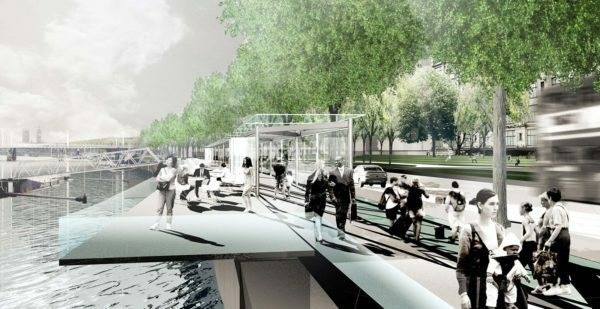 To transform the Embankment from an inaccessible vehicular barrier into a pedestrian attraction, we proposed a number of strategic interventions. Widening the riverside walk means that pedestrian space becomes dominant and there is room for another row of trees. This second layer of space distances pedestrians from the road and offers a zone for linear kiosks; a recreational infrastructure, which could be taken up by restaurants and bars, exhibitions, book stalls, markets, musicians and performers, or interpretation centres for the memorials and monuments. The Victoria Embankment could become a recreational park-like environment comparable to the South Bank but with a distinct character whilst maintaining current traffic capacity. Our study set out strategies for making pedestrian connections to integrate the Embankment Boulevard with the South Bank of the river, the urban hinterland to the north and transport infrastructure. The Embankment is also a unique setting for major events, celebrations, marches and the Marathon. It offers variations in use and character, during the course of a day, a week or a season. Improvements to the pedestrian environment, recreational infrastructure and engagement with public art could realise the Embankment’s potential to be a theatre for London events and Londoners.